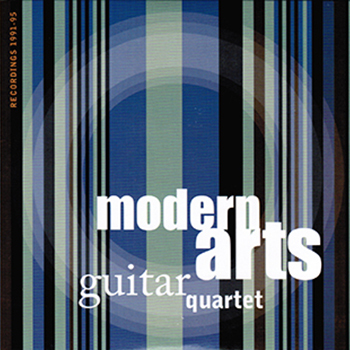 This deluxe edition CD/DVD embodies the best work of the Modern Arts Guitar Quartet. The audio CD was re-mastered from their one and only CD release, together with additional material from previously unreleased live and studio recordings, including James Phillipsen's Quartet No. 1 and Lawrence Schwedler's "Imaginary Career." The DVD documents their final concert on 16 June 1995 at UCLA's Jan Popper Theatre. Package Includes: CD and DVD, deluxe 6-panel wallet design, 12-page booklet with full program notes, history, biographies and photos. Tracks listed below are for the CD; the DVD includes music by Claude Debussy, Peter Yates, James Phillipsen, Ernst Krenek, Buzz Gravelle, Nicolas Juárez, Igor Stravinsky, and Bill Weingarden. Note: the digital download from Bandcamp does not include the contents of the DVD, only the audio CD.